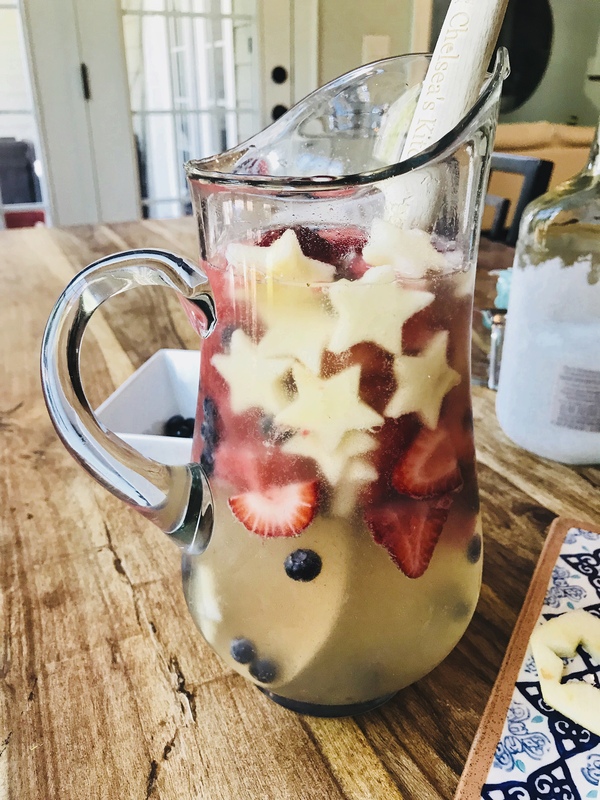 Star Spangled White Sangria for 4th of July – Nothing gets people in the mood to celebrate like sangria. Sweet, refreshing and alcohol-masking, it is a delishly deceiving party in a pitcher. The most authentic sangrias are simple with minimal ingredients. The times I’ve had sangria in Spain it was garnished with only a few orange slices. But sometimes more fruit is festive, especially with the red, white and blue pallette of strawberries, blueberries, star-shaped watermelon and honey crisp apples. Our family is doing a lot of traveling for the rest of the summer (Michigan, Philly, Baltimore, New York, Charleston) so this 4th of July we are having a staycation. We’re exploring our beautiful city of Charlotte by trying new restaurants each night and taking part in our Baxter Village community festivities like their 4th of July Parade, Music in the Park, and DJ Pool Party. There is also a backyard BBQ on Friday and I’m bringing this star spangled white sangria. Monday night at Pearlz Oyster Bar in Charlotte with my main men. I’m in love with the adorable mini star-shaped cookie cutter I used for the fruit. I even stored it in a high drawer so the boys don’t lose it. Someone was “helping me” by taste testing the fruit and making sure I didn’t leave things too close to the edge of the table (risk management). The wine, Tito’s and fruit mixture can stay in the refrigerator up to 24 hours before you add in the Fresca or La Croix. This makes for some very “tipsy” fruit. A light, refreshing and fun sip for your 4th of July or Memorial Day party. Clean and cut all fruit. Add strawberries first, then watermelon, apples and finally blueberries to your pitcher. Blueberries make the sangria cloudy, so feel free to reduce to 1/4 cup (they are there for color) and make sure to add them as the final fruit. If you are averse to Fresca or Sprite (I understand they are artificial), substitute with a flavored La Croix sparkling water and then add 3 Tbs of organic white Sugar in the Raw. I always like to be transparent so please know that I avoid sugar like the plague. This is high in sugar, so should be enjoyed as a dessert or a “once in a while splurge.” Maybe offset the rest of your meal with clean protein and low carb load veggies. I believe everything in moderation and life is sweeter with sangria once in a while. Really feelin’ the red, white and blue? Try my Red, White and Blueberry Cheesecake Dip.